Visceral malperfusion is a common complication of acute aortic dissections; its meaning and management is subject to high variability depending on the setting of onset (type A or type B dissection), the degree of severity and the affected organs. The term “visceral malperfusion” is an ill-defined entity as confusion reigns in the literature regarding its definition and whether it refers to mesenteric malperfusion only or if it includes also renal malperfusion. This distinction is crucial for decision-making in the clinical setting, for clarity in reporting of clinical series and interpretation of available data. Renal failure is a well-known prognostic factor for poor outcome in the setting of acute aortic dissection; however diagnosis of renal ischaemia as opposed to renal failure from other causes remains an open challenge. Mesenteric malperfusion and ischaemia are probably second only to rupture as a direct cause for mortality; in most cases clinical diagnosis becomes obvious only when irreversible damages have occurred and outcome of treatment is often frustrating. Early diagnosis on the other hand proves to be extremely difficult and far from being an exact science. 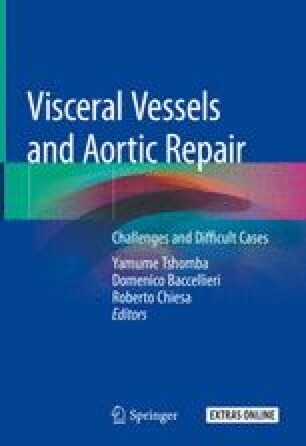 The aim of this chapter is to highlight the limitations of our current knowledge about “visceral malperfusion”, its definition, the available diagnostic tools and therapeutic approaches and to get the reader curious about this complex entity, cautious with judgement and creative when solutions are needed.